Perry Friedman came into the level as the short stack with just 240,000 (6 BBs) and was the next player eliminated in 4th place ($53,470). Friedman completed the bet to 20,000 with the J , John Monnette raised to 40,000 with the 9 , Friedman reraised all in and Monnette called. 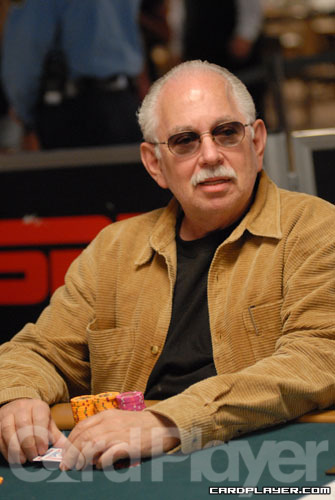 Friedman was ahead with high cards when the money went in on third street, but Monnette made a pair of sevens on sixth street to win the pot and eliminate Perry Friedman in 4th place ($53,470). 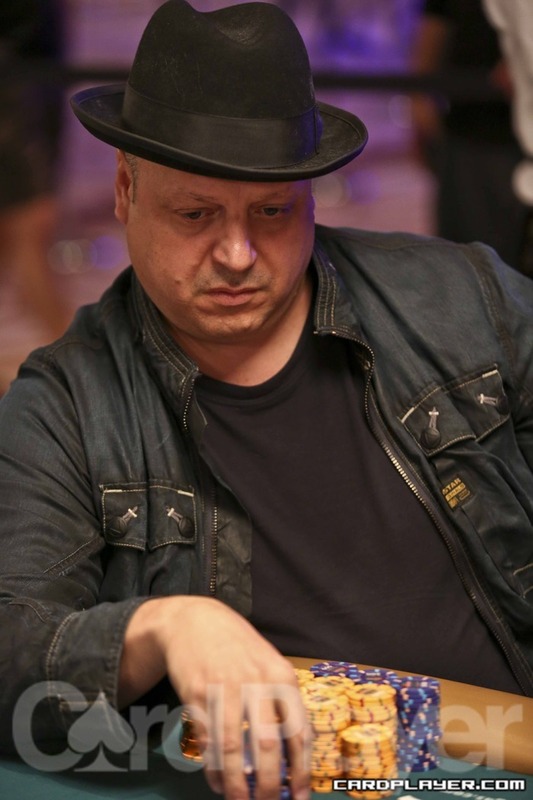 John Monnette jumped up to second in chips after eliminating Perry Friedman in 4th place ($53,470), and then went on to steal the lead from Huu Vinh after getting paid off with a straight on a hand that went to a showdown. That hand put Monnette out in front with just under 900,000 and knocked Vinh down to about 650,000. Vinh then lost another showdown to Timothy Finne after getting a bet in on every street. Vinh fired at the river and Finne called called with a pair of tens to win the pot. That hand put Finne up to just under 800,00 while Vinh was left on the short stack with just about 500,000 (12 BBs). The remaining 3 players took a one hour dinner break at the conclusion of Level 24 and will return at approximately 10:20pm local time to resume play. Despite starting the day short and finding several double ups over the past few levels to survive the increasing limits, Bryn Kenney entered Level 23 on the short stack with just over 2 big bets and was eliminated shortly after it began. Bryn Kenney completed the bet to 15,000 with the A and Huu Vinh called the raise with the 7 . Kenney bet 15,000 with ace-high on fourth street. Kenney checked on fifth street, Vinh bet 30,000, Keneny raised all in and Vinh called the check-raise. Vinh was ahead with a split pair of sevens on fifth street when the money went in and Kenney failed to improve by the river. Bryn Kenney was eliminated in 7th place ($27,062) while Huu Vinh secured his chip lead with about 720,000. John Monnette completed the bet to 15,000 with the 7 , Mark Dickstein raised to 30,000 with the 10 and Monnette called. Dickstein bet 15,000 with ten-high on fourth street and Monette called. Dickstein bet 30,000 on fifth street, Monnette raised to 60,000 and Dickstein called all in. Dickstein was ahead with a pair of tens on fifth street when the money went in, but Monnette had four spades and hit a fifth on the river to make a flush, eliminating Mark Dickstein in 6th place ($33,325). Jeffrey Lisandro completed the bet to 15,000 with the 9 , andPerry Friedman called with the 4 . Lisandro bet 15,000 with king-high on fourth street, Friedman raised to 30,000 and Lisandro called all in. Lisandro was ahead with a split pair of fours on fourth street when the money went in, but Friedman caught a straight on the river to win the pot and eliminate Jeffrey Lisandro in 5th place ($41,789). The final table of Event no. 10 ($5,000 – Seven Card Stud) is now underway, and Card Player will be posting level-by-level updates with all of the action, current chip counts, and prize distributions. With the elimination of Eugene Katchalov in 9th Place ($18,693), the official 8-handed final table is now set. Play will begin in Level 21 with limits of 10,000-20,000 and a 2,000 ante, and will continue until a winner is determined. Perry Friedman raised to 900 from middle position and was three-bet to 3,000. Friedman made the call and the flop was K 10 3 . Friedman checked and called a bet of 3,000 from his opponent. The turn was the A and both players checked. The river came the 9 and Friedman checked and called a bet of 5,000. His opponent showed J J and Friedman’s K Q took the pot. George Lind got his last 19,000 in the middle and was called by his opponent. Lind showed K K and his opponent showed J J . The dealer didn’t bring a jack to the board and Lind doubled up to 40,000. A player in middle position bet 800 and Jim Collopy raised to 2,675. A player directly to his left smooth called and so did the original raiser. The flop came A 10 3 and it was checked to Collopy. He fired out a bet of 5,275. The opponent to his left called and the original bettor folded. The turn brought the 6 and Collopy bet 11,575. His opponent raised him to 31,575. Collopy tanked before finally calling. The turn brought the 2 and Collopy checked. 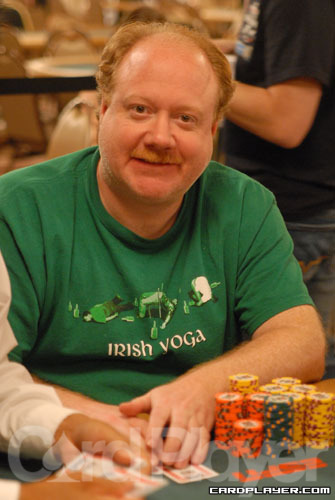 His opponent instantly moved all in for 25,000 and Collopy went into the tank once again. He eventually called and his opponent tabled A-K for top pair. Collopy rolled over the same hand for the chop. On a flop of Q 5 5 Dan Harrington’s opponent check-called a bet of 1,500. The 9 on the turn prompted a bet from both players. The 4 fell on the river and Harrington’s opponent checked. Harrington bet 3,000 and was called. Harrington tabled the A 3 and his opponent mucked. Harrington is back to the starting stack of 30,000 again. On a flop of Q Q 10 Alexander Kostritsyn bet 3,000 before his opponent raised to 10,000. Kostritsyn called. The turn brought the 2 and Kostritsyn check-called 10,000. The 8 landed on the river and action went check-check. Kostritsyn tabled the Q 9 and was good. He was up to 106,000 after the hand. The board on the turn read K 4 9 A and Jordan Smith checked over to his opponent, who bet 1,900. Smith called and they saw the 5 fall on the river. Both players checked and Smith turned over A K , giving him top two pair and the pot. Smith climbs to 34,300 with the win. Jason Reisenberg got all in preflop for 8,750 holding A A against his opponent’s A K .
The flop came 2 9 6 and his opponent started begging the dealer for running clubs. The 2 turn left him drawing dead and the 6 finished the board, doubling Reisenberg up to around 18,000. 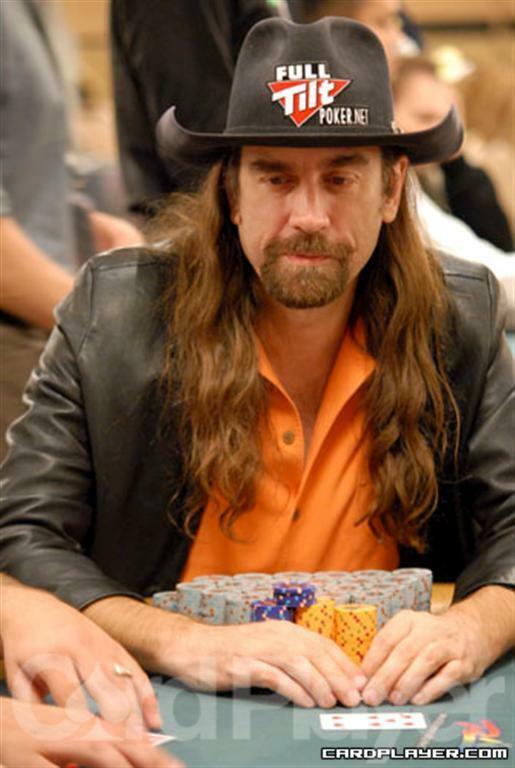 Seat 4 raised to 800 preflop from under the gun and was called by Orel Hershiser and the player in the big blind. The flop ran K 3 7 and all players checked. The 7 landed on the turn and the big blind bet 1,250. Seat 4 called and Hershiser reraised to 3,600. The big blind called and seat 4 got out of the way. The 2 came on the river and both players checked it down. Hershiser showed K 9 for two pair with a nine-kicker. The big blind looked surprised as he turned over K J for the same two pair with a higher kicker to take the pot. Hershiser had 20,400 after the hand. Seat 3 raised to 800 and Eric Ladny made the call. The flop ran 7 7 K and both players checked. When the turn brought the Q , Ladny checked to seat 3 who fired 1,000 into the pot. Ladny called and the 2 fell on the river. Ladny again checked and when seat 3 bet 2,500 Ladny thought for a while and let his hand go. Ladny had around 30,000 after the loss. Three players were in a pot that saw a flop of K Q 4 hit the felt. Keven Stammen fired 2,200 and Freddy Deeb made the call, as did another player. The turn was the 10 and everyone checked. The river was the Q and Deeb led out with 6,000. The other player in the hand folded, but Stammen repopped it to 37,000 total. Deeb only had 11,000 behind and made the call. Deeb then tabled A J for a Broadway straight, but Stammen showed K Q for a full house and Deeb’s main event was over. The player in the small blind limped in and Chris Moorman moved all in. The small blind called and the players tabled their hands. Moorman was outflopped and could not catch up the rest of the way and his main event was cut short on day 1. 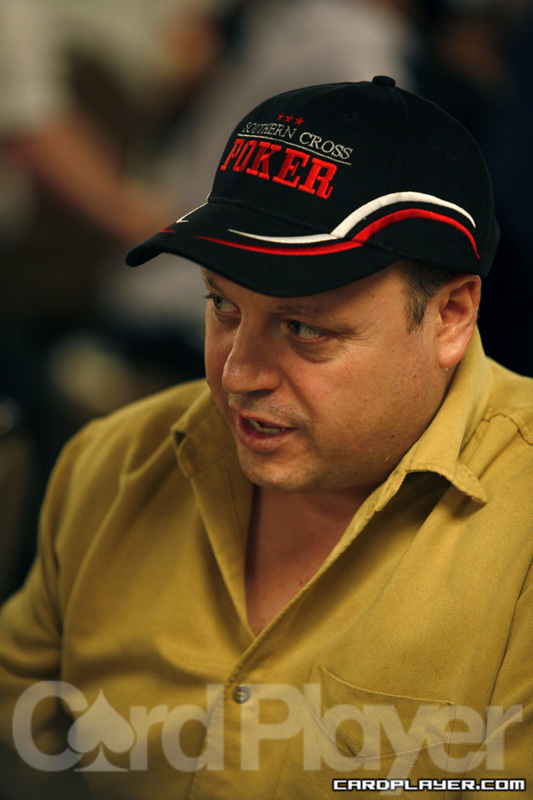 Mark Vos raised to 700 preflop and action folded around to Peter Hedlund. He reraised to 3,000 and Vos came back over the top, moving in for 8,450. Hedlund called and showed down A K . Vos tabled Q Q and things were looking good for Vos. But the turn brought another ace to the party and Vos couldn’t hit his set on the river and he was eliminated. A player in middle position raised to 850 and Jerry Yang all in 3,925. Action folded around to the middle position player. He made the call and Yang showed K Q . The middle position player showed 2 2 and the flop fell Q Q 3 . The player in the big blind then announced that he had folded a deuce. The turn was the K , filling up Yang and the river was the case 2 . Yang doubled to 8,000. 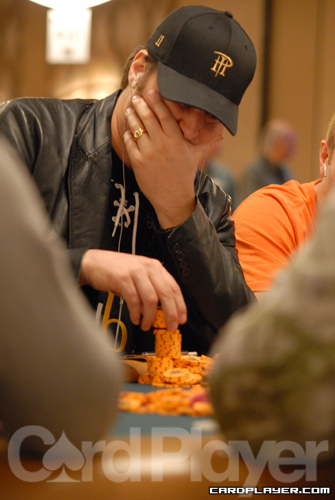 Perry Friedman took a flop heads up against his opponent and the flop fell 9 9 8 . After a series of bets and raises all of the money got in and the cards were turned face up. Friedman showed K 9 , which was miles ahead of the A A of his opponent. The turn was the 7 and the river was the 8 , giving Friedman a full house and the pot. Jason Alexander raised from the hijack position and was called by the small blind. The flop was A 10 4 and both players checked. The turn was the 6 and the small blind checked again. Alexander decided it was time to bet and put out 1500 into the middle. He was met with a check-raise to 3500 from the small blind. After some thought, Alexander put in the call. The river was the 8 and both players checked. Alexander tabled the 9 9 , but the small blind turned over A Q and took the pot. Over at the feature table, the flop came down 4 3 2 and the action was checked to Lex Veldhuis. He fired 2,300 and his opponent made the call. The turn was the 9 and action was checked to Veldhuis again. He fired 6,000 more chips into the pot and his opponent stuck around. The river was the A and action was checked again to Veldhuis. He then moved all in for over 40,000, having his opponent covered. This induced a fold and Veldhuis then tabled K 6 for absolutely nothing. He raked in the pot and was at 70,000. 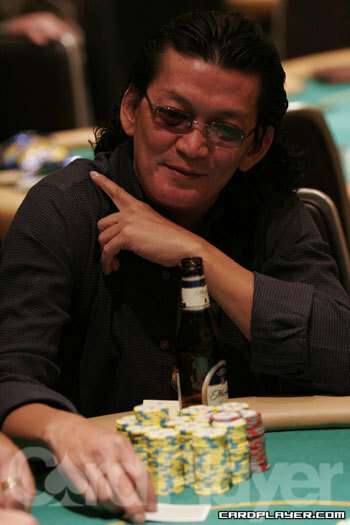 After being moved to a new table, Jerry Yang made it 900 to go preflop and was three-bet by Steve Paul-Ambrose to 2550. 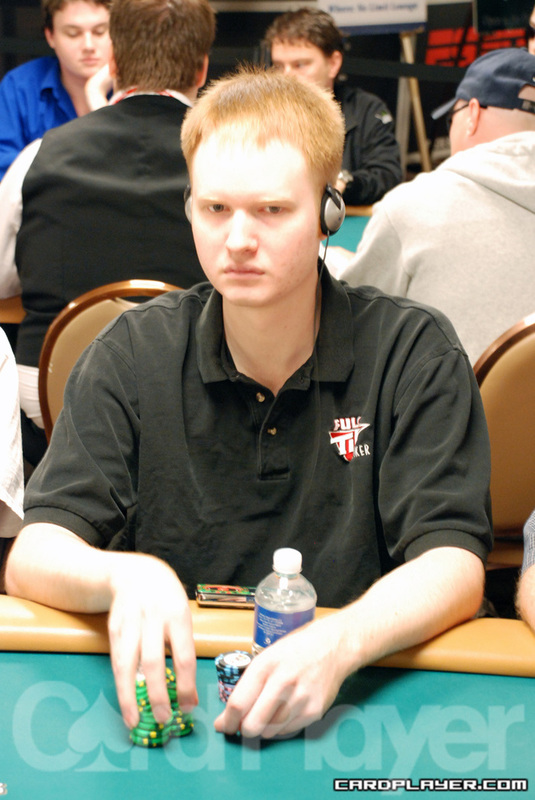 Yang called and they saw a flop of 2 K 8 and Steve Paul-Ambrose put out enough to put Yang all in. Yang put in the call and said “This is the hand I won the World Series with,” said Yang as he tabled the 8 8 , giving him middle set. Steve Paul-Ambrose showed the 9 9 and needed to improve to take the pot. The turn was the K and the 5 , doubling up Yang to 17,000. After the three players all came in for 200, fourth street was dealt and Forrest bet 800. Buss mucked but Turner made the call. Forrest bet 1,600 and Turner called. Forrest bet another 1,200 and Turner stuck around again. The river was then dealt and both players checked. Forrest showed (9 3 3 ) for two pair and Turner mucked. Forrest was at 27,000 while Turner was at 18,000. Gavin Smith bet 1,600 and Minieri called. Friedman then raised to 3,200 and his opponents called. The river was then dealt and Friedman fired 1,600 and everyone called. Friedman turned over (9 9 X) for a full house. He then gave Greg Raymer credit for calling his hand correctly. “It’s my best game,” Raymer replied. Smith then showed (7 K 2 ) for a 7-6 low. It was no good, however, as Minieri showed (J 4 2 ) for a 7-4 low. Minieri and Friedman chopped the pot while Smith was wittled down to 13,400. Minieri was at 60,000 while Friedman was at 24,000. A Pox On The Seven Of Hearts! On third street, each player was in for four bets and fifth street saw both players in for one more bet. On sixth street, seat 5 fired 1,600 and Matusow made the call. Seat 5 bet another 1,600 and Matusow came along again. The river was dealt and seat 5 bet another 1,600. Matusow agonized on what to do and finally threw in the call. His opponent showed (5 J 7 ) for a straight. Matusow then looked ready to erupt and took his frustration out on his opponent’s card, the 7 . He launched it clear across the table and it fluttered to the floor. “He four-bet with J-7-5?” Matusow questioned. He mucked his hand and he was down to just 5,100. Daniel Negreanu is all over the place. He went around sniffing people’s hair earlier and now he engaged in a conversation with a woman on the rail. “Who are you wearing,” he asked her in his best fashion designer accent. “Dead Bambi?” he asked after she answered. “You like to kill dear?” The woman laughed uncontrollably and Negreanu then posed with her for a picture. 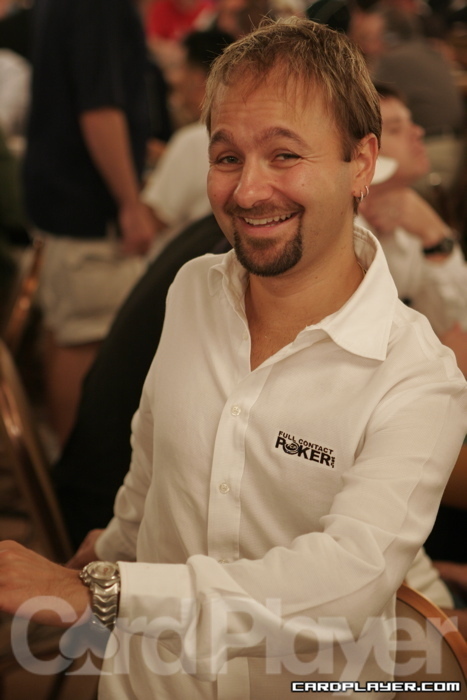 Prior to that, Negreanu was involved in a hand and showed his Compton roots as he began to rap. “What you gonna do son, what you gonna do?” he spit for a few choruses. It is unknown when his rap album is coming out, but it should be a dandy. Dan Heimiller bet 12,000 and both Lisandro and Friedman made the call. Heimiller bet 24,000 and both of his opponents came along again. Hemiller put the rest of his chips into the middle and Lisandro and Friedman both called. After the river was dealt, both players checked and Heimiller showed (J 6 6 ) for a set of sixes, better known as the number of the beast. Both opponents mucked and Heimiller tripled up to almost 200,000. Dan Heimiller bet 24,000 and Nguyen made the call. Heimiller bet 24,000 and Nguyen called again. The river was dealt and Heimiller bet 24,000. Nguyen made the call and Heimiller turned over (A 7 9 ) for aces up. But it was no good as Nguyen showed (A 10 8 ) for a queen-high straight. Nguyen scooped the pot and was at 240,000 while Heimiller was back down to 50,000. Unfortunately for Heimiller, he got involved in his final hand a bit later against Perry Friedman. Heimiller hit two pair but Friedman hit a set and as quickly as Heimiller was given new life, it was taken away as he busted in 15th place. Bronshtein completed to 12,000 and Mosseri raised to 24,000. Bronshtein called all in and was already in bad shape as Mosseri had a better flush draw. On the next four streets, Mosseri did not miss once as he made a full house, but Bronshtein had outs as he was drawing to a 7-low. Unfortunately, he paired up on the river and he was eliminated. Yan Chen led out with 6,000 and Smith raised to 12,000. Todd Brunson made the call, as did Chen. Smith bet 12,000 and both opponents called. Smith bet 12,000 and Brunson raised to 24,000 despite Smith showing a set. Chan mucked and Smith just called. On the river, Smith bet 12,000 again and Brunson just called. Smith then showed (6 2 2 ) for a full house and Brunson mucked. Smith was at 180,000 while Brunson was down to 60,000. He would later lose the rest of those chips and make his exit from the tournament. Jon Turner fired 12,000 and both Tehan and Friedman made the call. The river was then dealt and everyone checked. Turner turned over (Q-10-X) for two pair. Tehan and Friedman both mucked and Turner scooped the pot. He was at 205,000 while Tehan was at 165,000 and Friedman was at 145,000. 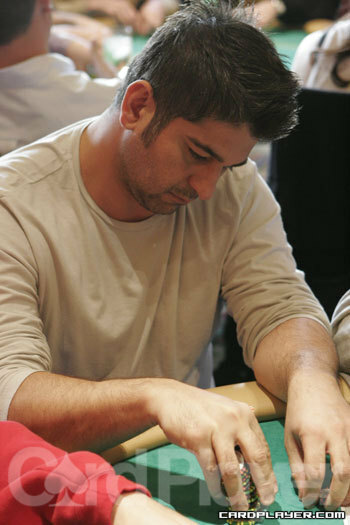 Berman was forced to move all in on the next hand and he was eliminated from the tournament in 12th place. Perry Friedman brought it in with X-X-3 and Scotty Nguyen completed with X-X-4 . Jeffrey Lisandro raised with X-X-5 . Friedman mucked and Nguyen made the all-in call. Lisandro made trip eights and Nguyen failed to qualify low. Lisandro scooped the pot and Nguyen was eliminated in 11th place. Smith made trip threes to beat the pair of Queens held by Friedman, and Smith scooped the pot thanks to the fact that neither player qualified low. Friedman was eliminated in 10th place. Perry Friedman has busted out of the tournament shortly before the dinner break, continuing the march of the professionals to the rail today. Nick Schulman raised to 1,200 from the cut-off in an open pot. The action folded to the player in the big blind who made the call. The flop came J 8 5 , and both players checked. The 6 generated a bet of 3,000 from the player in the big blind, and Schulman instantly jettisoned his hand into the muck. Schulman finished the hand with 80,000 in chips. Paul Wasicka successfully doubled up and survived elimination yet again, this time courtesy of pocket aces. The action folded to Wasicka, who pushed all in pre-flop for his remaining 4,500 from the cut-off. The button and small blind folded, and the big blind instantly called and turned over A J . Wasicka revealed his A A , and the board ran 8 8 7 6 2 . Wasicka finished the hand with slightly less than 20,000 in chips. 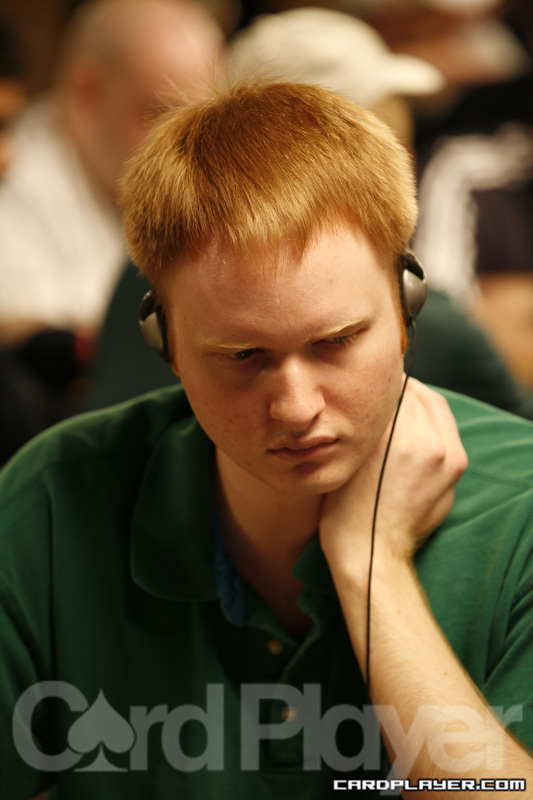 Patrick Antonius raised to 1,600 from middle position, and the next player to act reraised to a total of 4,500. The action folded back to Antonius who moved all in for his remaining additional 9,000. His opponent made the call and turned over 8 8 , the underdog to Antonius’ J J . The board ran K 6 6 6 4 , and Antonius finished the hand with 25,000. Harry Demetriou raised to 2,100 from early position and was reraised to 6,200 total. He made the call and the two players saw a 8-6-4 flop with two spades. After Demetriou checked his opponent bet 12,000. After a minute Demetriou raised all in for 24,225 more. His opponent took a couple minutes before calling with pocket aces. Demetriou had pocket tens and the turn and river didn't help him. Barry Shulman was in the big blind and called a preflop raise to 1600 from a player in middle position. The flop came Q Q 8 , and both players checked. 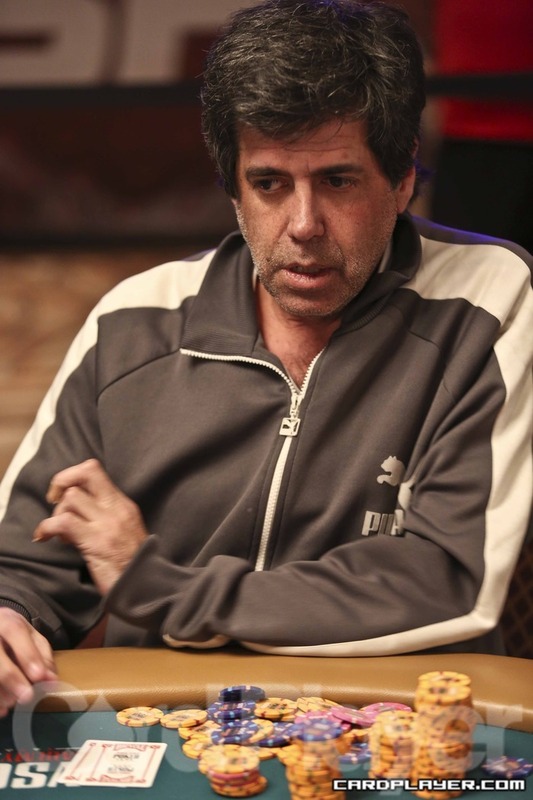 The 2 followed on the turn, and after Shulman checked, he called a bet of 5000. A third queen hit the river with the Q appearing, and after Shulman checked his opponent bet 10,000. 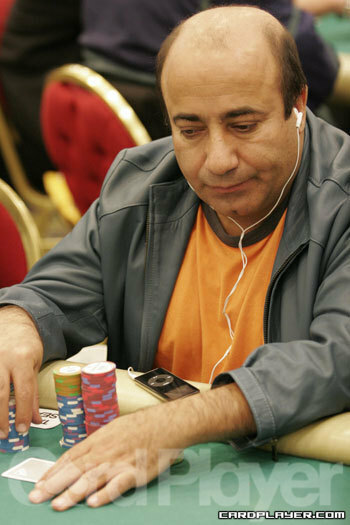 Shulman, with about 50,000 in chips, laid his hand down. Mark Vos raised from early position to 1300 and drew two calls including one from the player in the cut-off. The Q 10 9 flop brought two checks, and the cut-off bet 3000, which Vos called. The two were heads-up to see the 5 come on the turn, and both players checked. The A was the scare card on the river and now Vos led out for 7000. His opponent folded. Vos is at the same table as television/movie actor Ray Romano, though playing in the red section of the Amazon room means the table will be among the next to be broken. John Myung was in the small blind for 250, and saw a player in late position raise to 2000. Myung, with only 8500 in chips remaining, used this opportunity to move all-in. Play folded to the raiser, who needed to call 6500 to force a showdown. But with just over 21,000 in chips, he elected to lay his hand down. On a board of 10 9 4 2 , Bill Gazes fired a bet of 6,500, causing his two opponents to fold their cards. Gazes finished the hand with 25,000 in chips. 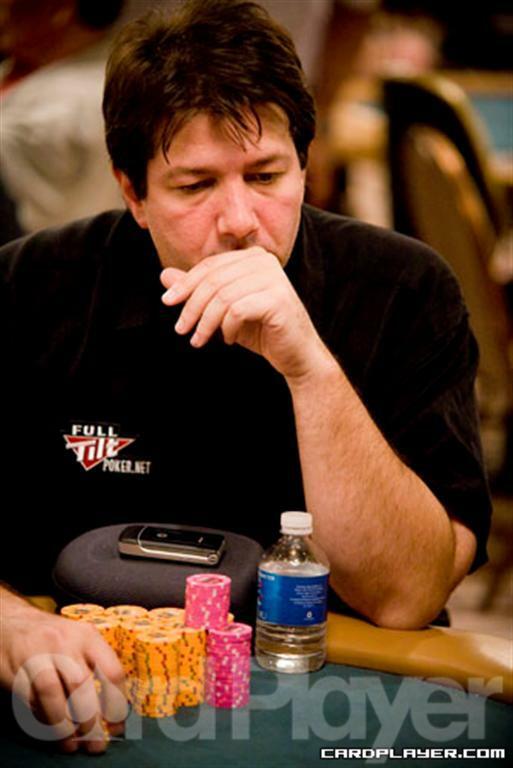 Paul Wasicka successfully doubled up, but still remains at fewer than 25,000 in chips. After the player on the button limped into the pot, Wasicka raised and the big blind folded. The button made the call, and the flop came queen high with two clubs. Wasicka pushed in his remaining 6,000 and the button made the call. Wasicka held K-Q, while his opponent held K 8 . The K on the turn was effectively a blank for Wasicka, reducing his opponent’s outs by one (the Q ). The river was a heart, and Wasicka won the pot. On a A K J flop Perry Friedman bet 3,600 and was called by one player. The turn was the A and Friedman bet 4,500. He was again called, and then the T came on the river. This time Friedman checked, and his opponent bet 11,000. Friedman was not happy with his stuation but eventually made the call. His opponent flipped over pocket jacks for a full house to beat Friedman's A-Q for trips. After the hand Friedman had less than 30,000 chips. An astounding 803 players entered today’s $1,500 H.O.R.S.E. event, surpassing all expectations. Eliminations were hard to find in the first two or three levels, but the pace picked up in the second half of the day. By the conclusion of day 1, only 184 players were left with a chance of taking home the World Series bracelet. A very familiar name sits atop the leaderboard: Phil Hellmuth concluded the day with an impressive 43,000 chips. Winning this event would give Hellmuth a 12th bracelet, further distancing him from Brunson and Chan. 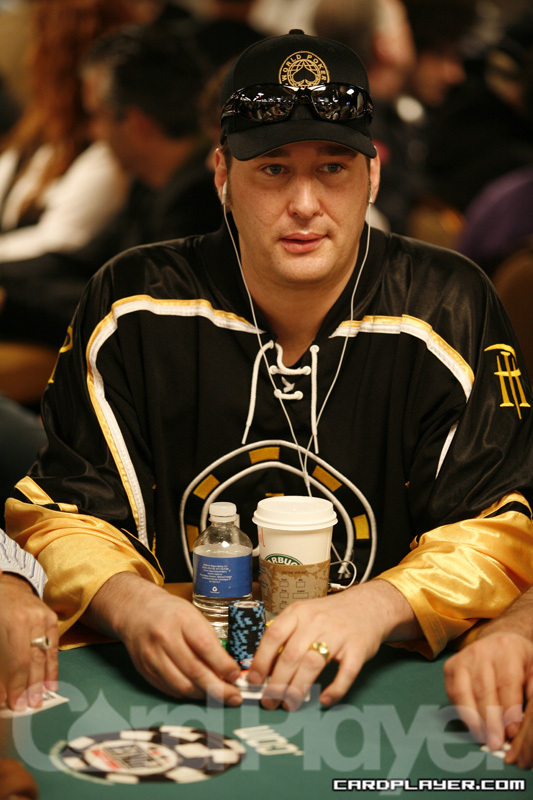 In addition, this would be Hellmuth’s first World Series win in a non-hold’em event. Action will resume tomorrow at 3 p.m and play will continue until the final table is reached. 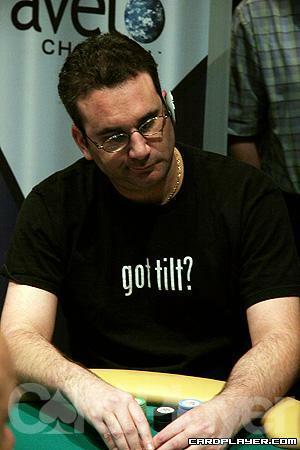 Going into fourth street with a 7 against Victor Ramdin’s 5 and another player’s 4 , Matusow, short-stacked, implored of the dealer, “I really need an ace on this next street.” The dealer gave the first player a K , Ramdin the T , and, to Matusow’s delight, he was delivered the A . He exploded, “That’s how to deal this game dealer!” Matusow bet out with his newfound confidence and the first player folded quickly. While Ramdin was thinking over his decision, Matusow kept up that chatter, saying that he didn’t care whether Ramdin called or not, that either way was good for him. Eventually though, Ramdin folded and Matusow raked in the pot. Victor Ramdin completed with the 5 and Matusow raised with the 10 . Ramdin called. Matusow bet fourth street, Ramdin raised, and Matusow called. Ramdin bet fifth street and Matusow called; the same happened on sixth street, only this time Matusow had no further chips to bet. Ramdin showed (Q )(J ) and Matusow, professing to having a pair of tens, called for Ramdin to catch “any baby red.” Matusow flipped up his cards: (A )(10 ). Matusow did have a pair of tens, but the fact that he also had an ace-high flush had completely escaped him until that moment. “I already have a flush!” The only card that Ramdin could catch to win the pot was the A , and when his final card blanked, the 8,000 chip pot was Matusow’s. 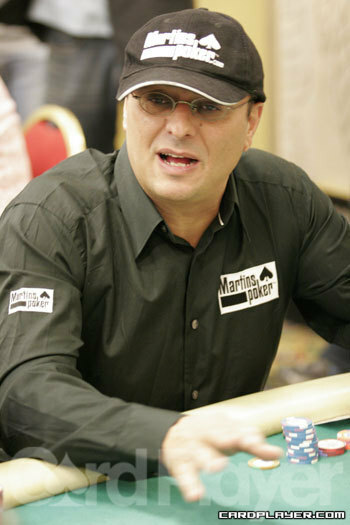 After the hand, Matusow continued on about his myopia (figuratively, though I believe he is also near-sighted): “I didn’t even know I had it! I knew I had ten-ten-ace...” Fortunately for Matusow he was all-in by the end of the hand anyway, so he didn’t miss gaining an extra bet anywhere. 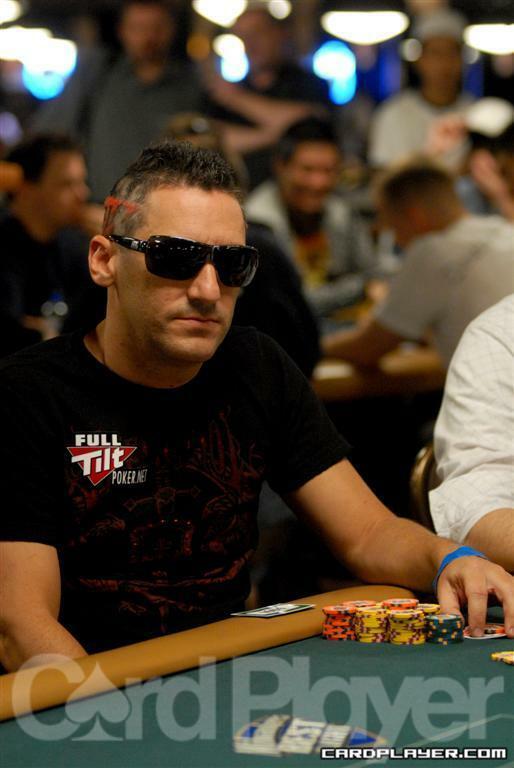 As Bryan Micon waxed about one of his recent bad beats, Matusow interrupted him and told him that he wasn’t allowed to tell any bad beat stories at the table. In fact, Matusow asserted, Micon was never in front during the hand; Ramdin was the favorite the entire way through. Micon explained his thought process during the hand, “I knew I was beat high but I had infinite odds; I was trying to scoop low.” At just that moment the fairly subdued Ramdin piped in with some of his own bombast. He averred, “You’re playing against Victor Ramdin. You’re not supposed to scoop the low.” This comment earned a (much coveted) high five from Mike Matusow. By the end of the level Ramdin was chip leader with 23,000, so he had reason to be cocksure. Micon needed two-pair to escape elimination, but things took a turn for the worse just seconds later when his opponent was dealt the 8 for aces up. “You are in a world of hurt, my friend,” opined Matusow, despite Micon drawing the 10 . Matusow was right, and Micon’s final card blanked. 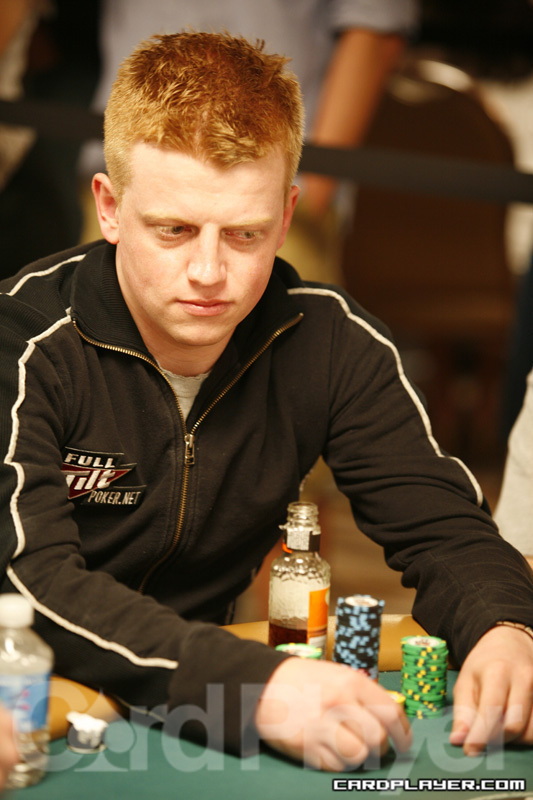 Micon, one of the chip leaders during the early stages of the day, could not quite make it to the end of day 1. Ferguson would need one of the remaining aces in the deck to stay alive. The turn was the 2 and the river was the 5 though, ending Ferguson’s day prematurely. Victor Ramdin raised it up from the button and, as so often happens in Omaha/8, the big blind called. On a flop of Q Q 10 the big blind bet out and Ramdin quickly met him with a raise. The big blind called and then check-called a bet on the turn (4 ). The river was the J and the action went check-call yet again. Ramdin showed A Q 5 4 for a full house and took down the pot. That hand kept Ramdin climbing, now all the way up to 13,500. Violette raised on third street with the 6 and her opponent called with the 2 up after having brought in. Violette bet again when she drew a king and her opponent appeared to blank with a nine. The boards only got better from there. On the next two streets, Violette received a pair of sixes while her opponent drew two hearts. On every single street Violette bet, and on every single street she was called. “Boat,” was her simple response when met with the last call, showing (7 )(7 )(8 ). After taking down that pot Violette sits just above average with 7,500. An announcement was just made by the tournament director, and with a field of 803 players starting the tournament, first-prize will be $256,412. This is nearly $100,000 more than last year’s first-place finisher took home, in large part due to the fact that the buy-in has been increased by 50%. With a few more than 400 players remaining the tables here in the Amazon Room (and some in the Brasilia Room) have begun to get more saturated with pros. No table is a better example of this than table 28. Sitting there earlier were David Sklansky, David Chiu, and Brian Micon. They were just joined by Victor Ramdin and Mike Matusow, whose chatter has been non-stop since arriving despite having only 2,800 chips. The river was a harmless 8 and Jacob claimed another scalp. This one helped escalate his chip stack to 8,000. David Chiu completed on third street and Victor Ramdin and another player made the call. Ramdin bet fourth street and was raised by Chiu. The third player folded, and Ramdin made the call. Both players open-paired up on fifth street, but Ramdin’s aces were far scarier than Chiu’s fives. Ramdin bet and Chiu called. Action was the same on the last two streets, and after the final call Chiu asked, “Jacks up good?” Ramdin turned over (8h)(6s)(5c). Jacks up were, in fact, no good. 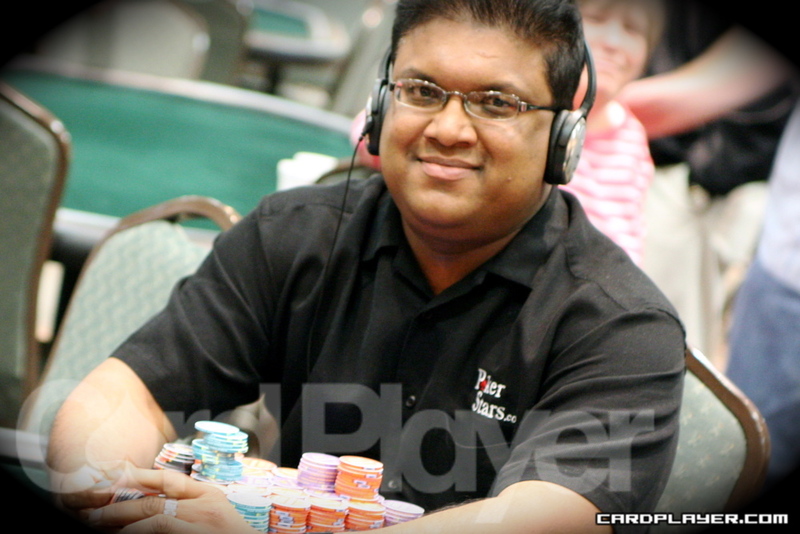 This pot propelled Ramdin to the heights of the chip leaders with 11,000. Chiu is not hurting for chips himself, with 7,600. Bryan Micon raised on third street and was called by his opponent, showing a ten. “You and I the whole day!” Micon continued, “At least we keep winning before playing each other.” Micon bet again on fourth street and was called. Then on fifth street, his opponent made a pair of tens and Micon folded to his bet. Micon exclaimed – more matter-of-factly than in any sort of Hellmuthian manner – “I had like the most concealed hand ever, and there wasn’t a single heart out!” As he said this he flipped over (8 )(7 ). His opponent replied in kind by showing his (A)(K). Micon has gotten off to a very strong start and currently has 7,400. A short-stacked Hasan Habib found himself all-in against on third street against an unknown opponent. Habib turned over (A )(3 ) for an ace-high flush draw against his opponent’s (K )(J ) for a pair of kings. Habib spiked a diamond on 6th street and that would be enough to take down the pot. Habib now has 1,300. Fresh off of his sixth place finish in the H.O.R.S.E. 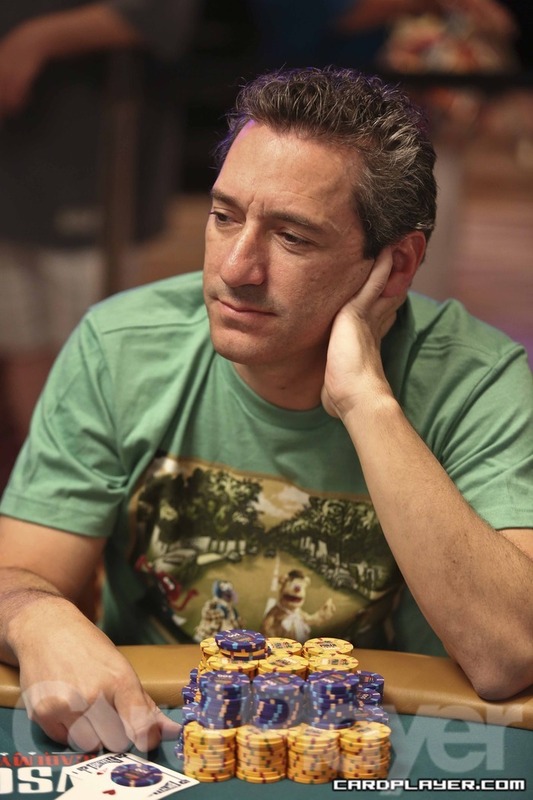 championship, Barry Greenstein took a seat in $1,500 H.O.R.S.E. tournament, hoping to continue his recent success. We joined one of his hands in progress on fifth street, where Barry called a bet from his opponent despite his opponent showing A 5 2 . His opponent paired his five on sixth street, and Greenstein check-called. On seventh street, Greenstein check-called again. His opponent turned up (4 )(3 )(J ) for a wheel, and Greenstein mucked his hand. Despite this temporary setback, Greenstein would end the hand with 5,300. 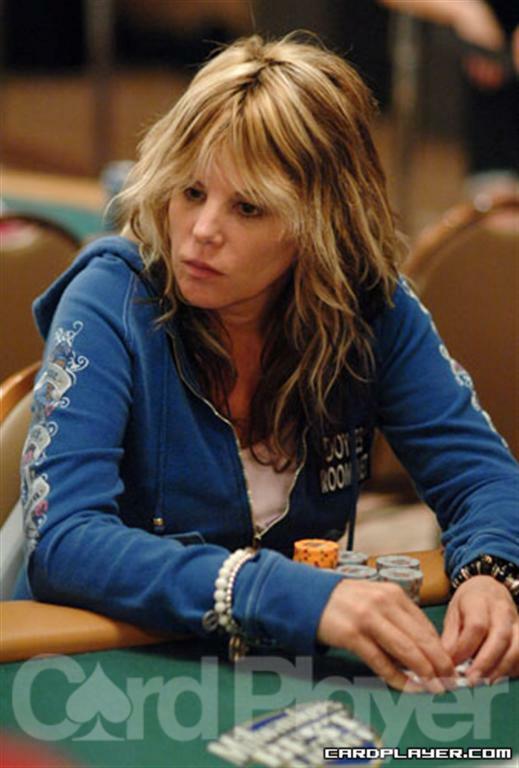 Jun 25, '08 2008 39th Annual World Series of Poker Event 45 - World Championship H.O.R.S.E. Play is done for the day. Day 2 action will resume at 3 p.m. The player in seat 7 raised in position and David Benyamine called from the small blind and Billy "The Croc" Argyros called from middle the position. The flop came 8 7 5 and both Benyamine and Argyros checked to seat 7, who bet. Benyamine and Argyros made the call. The turn was the J and action was again checked to seat 7. He bet and Benyamine called, but Argyros mucked. The river was the 4 , putting four hearts on the board. Benyamine bet out for the first time and seat 7 tanked. After lots of thought he made the call and Benyamine flipped over A 2 , for the flopped ace-high flush, and raked the pot. Full Tilt's Phil Ivey and Perry Friedman (who still has the Full Tilt logo on the side of his head) got involved in a pot when Ivey raised and Perry re-raised in position. Ivey made the call and the flop came K 8 6 . Ivey checked, Friedman bet out and Ivey made the call. The turn was the 10 and both players checked. Ivey bet out instantly when the 2 hit on the river and Friedman mucked his hand. Still, day one has not been kind to Ivey. He ended it with around 40,000 in chips. 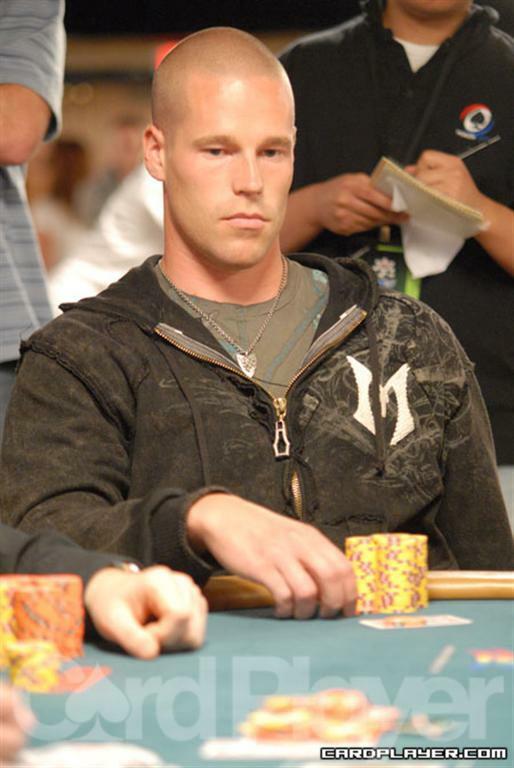 When his opponent bet out on the river on a board of K-J-5-8-2, Patrik Antonius raised. His opponent called and Antonius showed J-J-6-4 for a set of jacks to take the pot while his opponent sat shaking his head. Seeing that Schneider made an 8-low, his opponent mucked and Schneider took the pot. Oppenheim's 9-low was good enough to edge out his opponent's 10-low and he raked a sizeable pot. Both players made the six-low and they split the pot. Brandon Adams was showing the A when he bet out. His opponent was showing the Q and made the call. When Adams hit the A for his next card, his opponent shrugged at the early pair of aces in front of Adams and mucked his visible Q 9 . 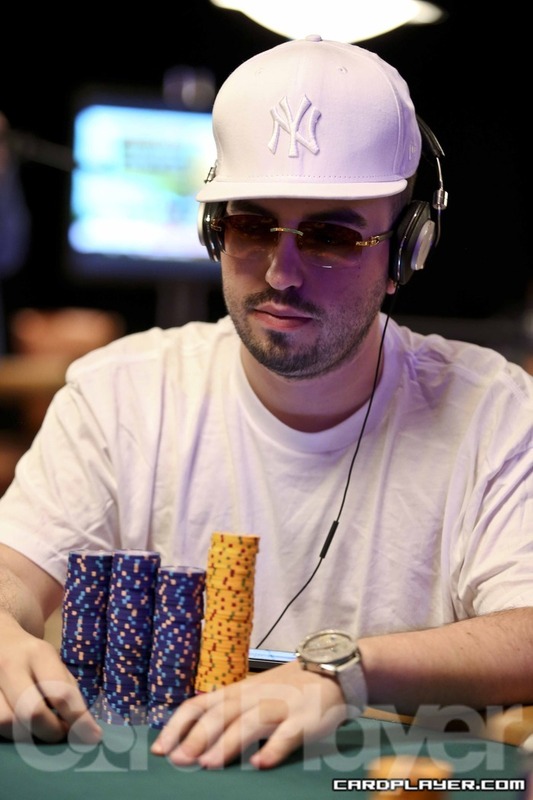 Fitoussi's two pair was better than Hellmuth's and Hellmuth was eliminated late in day one. 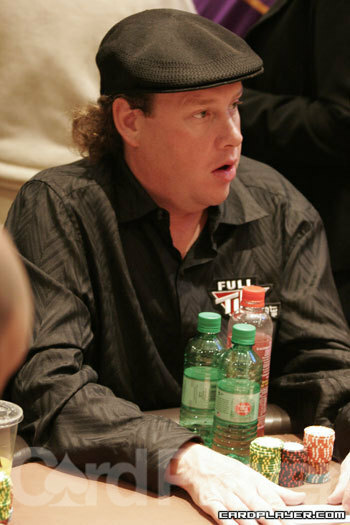 Dwan hit his ace-high flush and Hennigan angrily mucked his hand. Seeing Leonidas' two pair, Kostritsyn slowly mucked his cards and Leonidas took the pot. David Williams raised and the player in seat 2 re-raised all preflop. Gus Hansen, sitting in the small blind, made the call and so did Williams. The flop came 10 7 7 , Hansen checked, David Williams checked and seat 2 bet out. Hansen quickly re-raised, Williams folded and seat 2 folded A K face up. Hansen didn't show and just raked his chips while talking about how he played the hand. 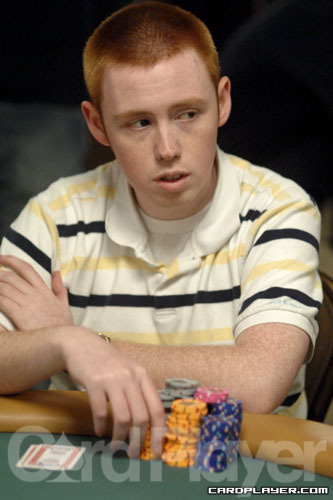 Perry Friedman bet and was called by Tom Dwan on every street of a A 6 5 10 8 board. Friedman flipped over A 4 for a pair of aces, and it was good enough to take the pot. On a flop of A 10 6 James Mackey checked and David Singer bet. Both Andy Bloch and Mackey made the call. The J came on the turn and Mackey checked again, allowing Singer to bet. Bloch made the call and Mackey said raise, then put in some more chips. Singer didn't hear Mackey say raise and the floor was called to the table. The dealer explained to the floorman that he did indeed hear Mackey say raise before he put his chips in, then he said it again while putting them in. The floorman said the raise stood and Singer and Bloch both made the call. The players checked the 3 river card and Mackey turned over A K 4 Q for the nut straight. When he saw Mackey's hand Bloch laughed and mucked. Singer also mucked and Mackey won a nice three-way pot again two of the better H.O.R.S.E players in the tournament. At the end of the level he sat with around 185,000 in chips. Layne Flack raised from late position and was called by Hasan Habib, Justin Bonomo and John Cernuto. The flop came 9 7 3 and action was checked to Flack who bet out. Both Habib and Bonomo called, but Cernuto folded. The turn was the 10 and action was again checked to Flack who bet out. Both opponents made the call again and the river brought the 7 . Action checked to Flack, he bet, Habib called and Bonomo folded. Flack turned over 9-9-A-4, giving him a set of nines to scoop the entire pot. The player in seat 2 bet the A 10 8 flop and Chad Brown made the call. On the 2 turn card seat 2 bet and Brown raised. Both players checked the 4 river and Brown turned over A-8-4-6. His opponent showed A-10-5-7. There was some brief confusion as to who got what, but the dealer explained that Brown's opponent had the best two pair and low hand because Brown had not made a low hand. Sheikhan went ahead and bet blind after being dealt the final card. He showed a big hand - 6-low. Seat 4 paired his 8 on the end and Sheikhan took down a big pot. After the hand Sheikhan told the table, "You guys want to gamble - I'll gamble." Sheikhan had around 167,000 in chips. Seeing Forrest's three queens, Hellmuth quietly slid his cards into the muck. 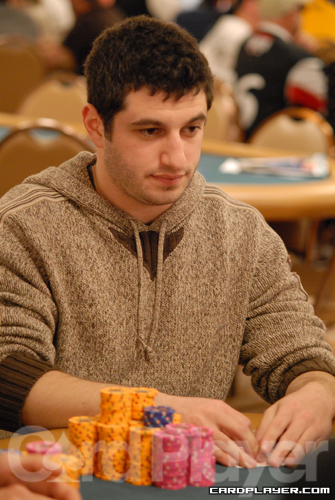 Phil Galfond bet on fifth and sixth street and was called by Robert Williamson III and Phil Ivey. When Galfond led out on the end, Ivey mucked his hand and Williamson looked pained as he thought over his decision. Williamson eventually mucked, and Dwan started to infer about his friend Galfond's hand. Galfond smiled and the table laughed when he showed only one card - the 7 .